Today, it is well understood that Mars is a cold, dry, and geologically dead planet. However, billions of years ago when it was still young, the planet boasted a denser atmosphere and had liquid water on its surface. Millions of years ago, it also experienced a significant amount of volcanic activity, which resulted in the formation of its massive features – like Olympus Mons, the largest volcano in the Solar System. Until recently, scientists have understood that Martian volcanic activity has been driven by sources other than tectonic movement, which the planet has been devoid of for billions of years. However, after conducting a study of Martian rock samples, a team of researchers from the UK and United States concluded that eons ago, Mars was more volcanically active than previously thought. Their study, titled “Taking the Pulse of Mars via Dating of a Plume-fed Volcano“, recently appeared in the scientific journal Nature Communications. Led by Benjamin Cohen, a researcher with the Scottish Universities Environmental Research Center (SUERC) and the School of Geographical and Earth Sciences at the University of Glasgow, the team conducted an analysis of Mars’ volcanic past using samples of Martian meteorites. On Earth, the majority of volcanism occurs as a result of plate tectonics, which are driven by convection in the Earth’s mantle. But on Mars, the majority of volcanic activity is the result of mantle plumes, which are highly-localized upwellings of magma that rise from deep within the mantle. This is due to the fact that Mars’ surface has remained static and cool for the past few billion years. Because of this, Martian volcanoes (though similar in morophology to shield volcanoes on Earth), grow to much larger sizes than those on Earth. 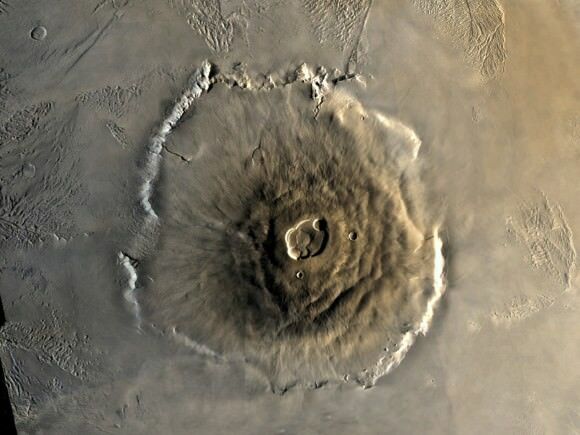 Olympus Mons, for example, is not only the largest shield volcano on Mars, but the largest in the Solar System. Whereas the tallest mountain on Earth – Mt. Everest – is 8,848 m (29,029 ft) in height, Olympus Mons stands some 22 km (13.6 mi or 72,000 ft) tall. For the sake of their study, Dr. Cohen and his colleagues used radioscopic dating techniques, which are commonly used to determine the age and eruption rate of volcanoes on Earth. 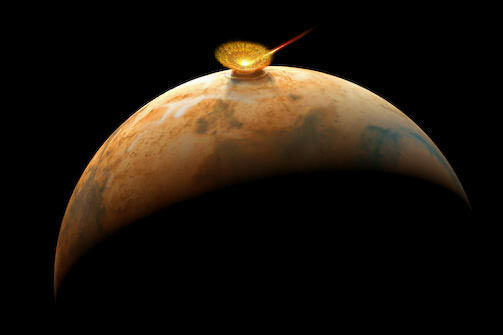 However, such techniques have not been previously used for shield volcanoes on Mars. As a result, the team’s study of Martian meteorite samples was the first detailed analysis of growth rates in Martian volcanoes. The six samples they examined are known as nakhlites, a class of Martian meteorite that formed from basaltic magma roughly 1.3 billion years ago. These came to Earth roughly 11 million years ago after being were blasted from the face of Mars by an impact event. By conducting an analysis of Martian meteorites, the team was able to uncover about 90 million years’ worth of new information about Mars’ volcanic past. The first step was to demonstrate that the rock samples were indeed Martian in origin, which the team confirmed by measuring their exposure to cosmogenic radiation. From this, they determined that the rocks were expelled from the Martian surface 11 million years ago, most likely as a result of an impact event on the Martian surface. They then applied a high-precision radioscopic technique known as 40Ar/39Ar dating. This consisted of using a noble gas mass spectromomer to measure the amount of argon built up in the samples, which is the result of the natural radioactive decay of potassium. From this, they were able to obtain 90 million years’ worth of new information about the Martian surface. The results of their analysis indicated that there are significant differences in volcanic history between the Earth and Mars. In addition, the team was also able to narrow down which volcanoes their rock samples came from. Previous studies conducted by NASA revealed several candidates for the possible nakhlite source crater. However, only one of the locations matched their results in terms of the age of the volcanic eruptions and the impact that would have ejected the samples into space. This particular crater (which is currently unnamed) is located in the volcanic plains known as Elysium Planitia, roughly 900 km (560 mi) away from summit of the Elysium Mons volcano – which stands 12.6 km (7.8 mi) tall. It is also located about 2000 km (1243 mi) north of where the NASA Curiosity rover currently is. As Cohen explained, NASA has some wonderfully detailed satellite images of this particular crater. “It is 6.5 km wide, and has preserved ejecta rays of debris,” he said. “And we were able to see multiple horizontal bands on the crater walls – which indicating the rocks form layers, with each layer interpreted as a separate lava flow. This study has been able to provide a clearer picture into the history of the nakhlite meteorites, and in turn the largest volcanoes in the solar system.”In the future, sample return and crewed missions to Mars are sure to clear up this picture even further. Given that Mars, like Earth, is a terrestrial planet, knowing all we can about its geological history will ultimately improve our understanding of how the rocky planets of the Solar System formed. In short, the more we know about Mars’ volcanic history, the most we will be able to learn about the Solar System’s formation and evolution.